Thinking about Barbados for your honeymoon? Whether you want to laze on the beach or conquer every activity on offer, this Caribbean gem ticks all the boxes for post-nuptial bliss. A balance of relaxation and adventure is key to having the perfect honeymoon, and Barbados offers just that. You can dine at world-class restaurants, party with the locals or kick back and relax on beautiful beaches – and that’s just the start. If you visit at the right time of year you won’t have to deal with tons of tourists either, making it a top spot to experience with your better half by your side. Barbados may be a popular vacation destination but it also offers plenty of places to enjoy quality time without the crowds. It has palm-fringed beaches where you can enjoy hand-in-hand strolls, luxury villas with private hot tubs to soak in and spectacular sunsets to enjoy cocktails over. Barbados boasts an abundance of once-in-a-lifetime experiences for couples to have together, whilst retaining a romantic charm unlike many other mainstream vacation spots. From fine-dining restaurants to beachside fish frys, you’ll find some fantastic places to dine in Barbados. There are wonderfully romantic restaurants right at the water’s edge where you can enjoy candlelit meals while the sea sparkles in the moonlight. There are casual options too, where you can drop in, grab a snack and join in a game of dominoes with the friendly locals. For newlyweds seeking palm-fringed beaches, Barbados has an unlimited supply. The peaceful eastern shore is the place to take a blanket and a picnic and just spend the day relaxing together. On the west coast, many beaches are backed by beautiful villas and glitzy resorts; the scenery here is spectacular and the views never fail to inspire romance. Aside from sun, sea and sand, Barbados has more attractions per square mile than any other Caribbean island. You can tee off on a world-class golf course, hire a car and explore, try paddle boarding or kite surfing, test the famous locals rums, hit the shopping malls or get to know the local sites and celebrations. Barbados is home to an endless array of attractions, making it an excellent place to experience with someone truly special by your side. From flashy cocktail bars and beach clubs to rickety old rum shacks, Barbados is home to every kind of nightlife venue. St Lawrence Gap on the south coast gets lively after dark with a raft of bars and clubs. On the west coast, you’ll find upmarket nightspots on First and Second Streets in the heart of Holetown. Every Friday night, the fishing village of Oistins hosts a big street party which is popular with visitors and locals alike. Temperatures hover in the mid 80s for most of the year, but Barbados is at its best during the winter months when the climate is sunny and dry. In the summer and fall, daytime temperatures can creep up even higher, but these months coincide with hurricane season which runs from June to November. Deciding on the best time for your honeymoon comes down to your own personal preferences. If you visit in the middle of peak season (winter) you can expect great weather but it will be much busier and your honeymoon will be more expensive. If you visit during the low season it will be quieter and your trip will be cheaper, but you also risk some rain. Many couples honeymoon in Barbados during the ‘shoulder’ season months of April, May and November. These ‘windows of opportunity’ are out of peak season but not quite low season so you get the best of both worlds. Whatever time of year you choose to visit, a constant trade wind keeps the climate at a comfortable level. If you’re planning a honeymoon in Barbados, what could be more romantic than chartering a private boat and sailing along the island’s beautiful west coast? You can frolic on pristine beaches, snorkel hand-in-hand and float over a shipwreck teeming with tropical fish. Once you’ve worked up a hunger, you can refuel with a romantic lunch washed down with unlimited soda, rum punch and beer. 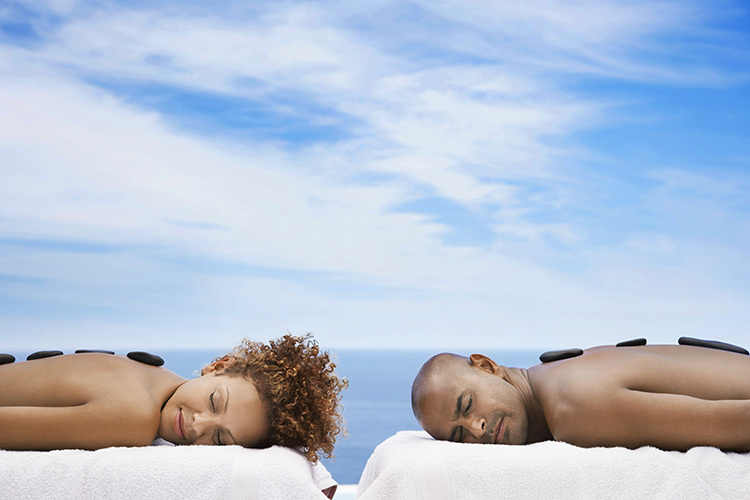 Enjoy rejuvenating time for two with a variety of treatments at one of the island’s exclusive spas. The Karma Spa at Sugar Bay offers a range of great experiences including massages, body treatments, facials, manicures, pedicures and wax treatments. The Romantic Couple’s Massage features a one-hour massage in a candlelit treatment room. You won’t be hard-pushed to find a romantic spot in Barbados to watch the sun go down. The Barbados Boardwalk is situated just south of Bridgetown and is one of the best places on the island to watch the sunset. There are several seats where you can perch with your significant other by your side. Alternatively, you can go on a sunset cruise or watch with a cocktail in hand from a beach bar by the sea. The award-winning Atlantis submarine tour is one of the most highly recommended things to do in Barbados. For a little extra romance opt for the evening tour where romantic music sets the mood as you sail underwater along the west coast. Co-pilots provide a running narrative of the marine life swimming past the large viewing ports during this popular feeding time on the reef. Couples can share a once-in-a-lifetime experience at Harrison Cave. One of the Caribbean’s greatest wonders, this underground cave system is home to amazing stalactites and stalagmites as well as pools of crystal clear water and flowing streams. You travel together by tram to all depths of the cave alighting at various stops to get up close to the sights. To celebrate a special occasion in style, nowhere on the island can match the award-winning Cliff Restaurant. Its theatrical torch-lit decks are perched above an idyllic cove where tarpon and stingrays swim in the floodlit water. The food and service are equally memorable, and although it’s not cheap it should definitely be one of the highlights of your honeymoon. To get your money’s worth, arrive early and soak up the views from the upper-level bar. 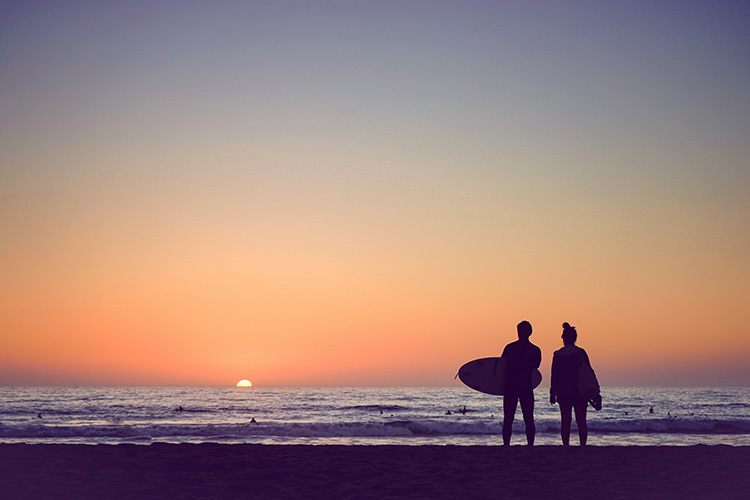 Whether you’re a seasoned surfer or a total beginner, you can take to the island’s famous surf beaches for a romantic ride on the waves. Located on the south coast in the parish of Christ Church, Miami Beach is the perfect place for surfing and bodyboarding. The eastern end of the beach picks up most of the swell, while the western side is better suited to swimming and snorkeling. You can book novice and advanced lessons at Barry’s Surf School. Located in St. James, the picturesque Folkestone Marine Park is a great spot to spend the day together. A ship that wrecked just off the shore has transformed the area into a popular site for snorkelers and diving enthusiasts. You can freely swim around the wreck, or view it from the comfort of a glass-bottomed boat. The park also features a museum, an aquarium, tennis courts and picnic tables overlooking the sea. Wandering hand-in-hand around Bridgetown, where you’ll find plenty of interesting sights, can easily occupy a day. It’s home to colonial buildings, a synagogue and Unesco World Heritage Sites like the Parliament Buildings and the Garrison. You’ll find museums and shopping malls, as well as a bustling marina where you can enjoy waterfront drinks and dining. It’s renowned as the birthplace of rum so it would be a shame not to drink some while in Barbados. Rum was first produced on the island in 1642 and is still widely produced using traditional local methods. You can take a rum tour at the Mount Gay Rum Distillery in Bridgetown and at the West Indies Rum Distillery where Barbadian Cockspur rum is produced. It’s a great way to have fun and get merry together. The St. Nicholas Abbey in St. Peter is another great attraction for anyone interested in the island’s rum history. The main house was built in 1658 but it has recently been restored to its former glory. It’s home to a plantation house, a museum and a rum distillery. Whether you’re going for a hole in one or just trying to hit it straight, they say that couples who play together, stay together. 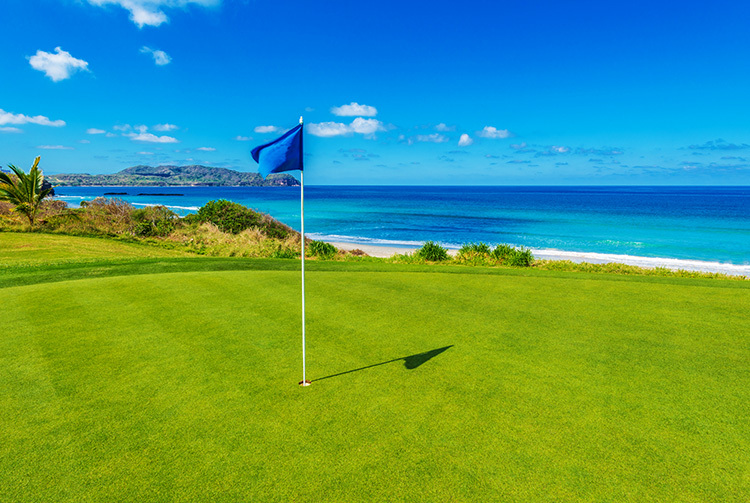 You’re in the right place too, as Barbados is a golfer’s paradise. The Royal Westmoreland course is a regular host of the PGA European Tour Seniors tournament, and Sandy Lane hosted the World Golf Championships in 2016. You can stay at any one of the conveniently located condos or villas nearby. For couples who appreciate nature but don’t necessarily want to venture into the jungle, the Barbados Wildlife Reserve is a must visit. You can go for the whole day and get close-up views of green monkeys, giant turtles and all kinds of other animals as they roam freely through the reserve. It’s a much nicer way to see the island’s wildlife than through bars like in a typical zoo. A good time to go is early afternoon as this is feeding time. You can celebrate the start of married life in style at one of Barbados’ world-famous festivals. Some of the best ones are the Holetown Festival in February, Holders Season in March and the rousing Crop Over Festival, which runs through the summer and attracts partygoers from across globe. The Barbados Food & Rum Festival is also worth visiting if you’re on the island in October. 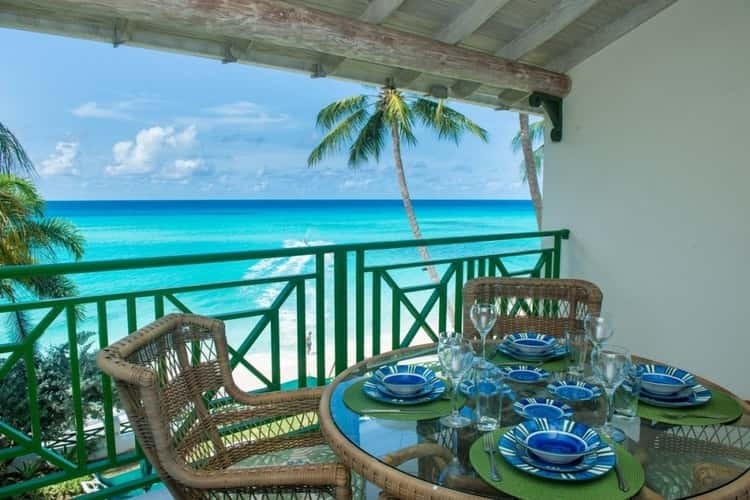 If you’re looking for accommodation for your Barbados honeymoon, the options offered by Top Villas are some of the best on the island. You’ll find everything from cozy 1-bedroom condos in affordable resorts to sprawling mansions where you can relax in ultimate style. Ideal for romance and relaxation, rentals are located in top spots across the island and they come equipped with luxury amenities throughout. You can rent this spacious 2-bedroom condo in Christ Church for very reasonable rates. It has an open-plan kitchen and dining area, a spacious balcony for alfresco meals and a large communal pool. It’s just a stone’s throw from the beach and within easy reach of local shops, restaurants and nightspots. 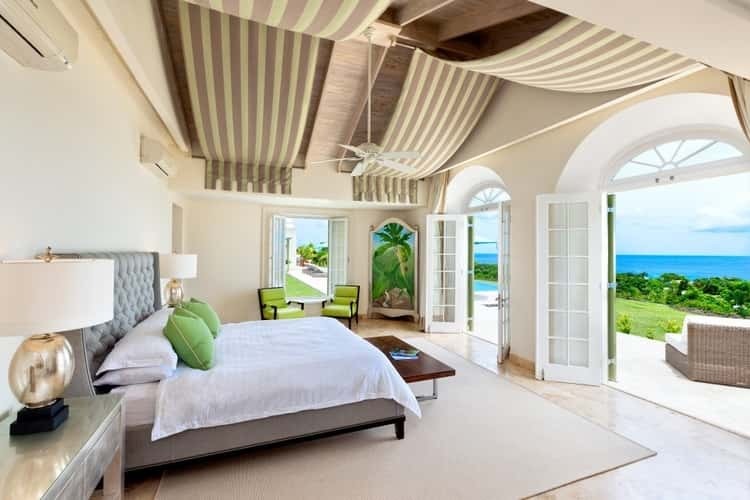 If you want to splash a bit more cash you can opt for something a little more elaborate like this custom-designed villa in St. James. It has a huge private pool and sumptuous sunbathing salas, plus sea views from every room. The villa is fully staffed with a cook and a housekeeper included in the price. Guests also get complimentary use of the resort’s private beach club. There are a few things you need to know before you visit Barbados. One important thing to bear in mind is that it’s against the law for anyone to wear camouflage clothing. Also, be aware that buses and cars tend to drive extremely fast – be careful and buckle up. Other advice is keep your beachwear reserved for the beach or around the pool. Thinking of booking a honeymoon in Barbados? Book with us and not only will you get beautiful accommodation at great prices, you’ll also benefit from amazing round-the-clock customer service plus access to a wide range of travel extras such as car hire or help with arranging a special experience.